The Kentucky Department of Agriculture (KDA) in collaboration with faculty and students with the University of Kentucky Department of Agricultural Economicshave released the 2016 Grower Production Reports with Kentucky Hemp Pilot Program participants. According to the information provided in the report, a total of 2,387 acres of hemp were planted of the 4,600 approved from the 2016 applications. There were 108 participating growers, and 267 individual reported plots/research fields. All plots varied in size, but the average amount planted was approximately 9 acres. The report shared planting methods for fiber, grain and CBD crops including seeding and transplanting rates, planting depth, equipment, and top varieties. It also mentioned fertilizer, from amounts of nitrogen to organic supplements, in addition to various issues growers faced like weed control, disease, pests, and labor/equipment inefficiencies. Harvests showed that a little more than half of the planted grain crops were harvested (499 of 812 acres planted). 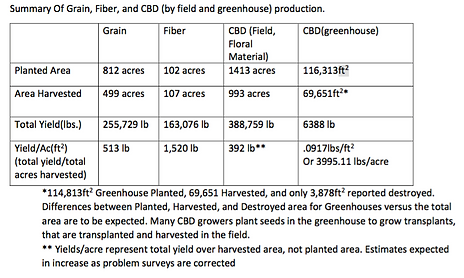 However, there was an increase in the amount harvested for fiber (107 of 102 acres planted), most likely due to a crop planted for grain or CBD being harvested for the fiber instead. Of the CBD crops planted, 70% of outdoor crops were harvested (993 of 1,314 acres planted), while only 59% of indoor (greenhouse) space (69,651 sq/ft of 116,313 sq/ft planted). Of the acres harvested, the average yields per were 513 lbs. of grain per acre, 1,520 lbs. of fiber per acre, 392 lbs. of outdoor grown CBD (floral material) per acre, and approximately 3,995 lbs. of indoor (greenhouse) CBD (floral material) per acre. Following basic production results, the report breaks down cost of production and financial inputs. According to the results, the average cost per acre is $515 for grain, $722 for fiber, and $1,950 for CBD production (but estimating the cost is closer to $5,000). In the correspondence sent to Kentucky Pilot Program participants by the Kentucky Department of Agriculture was also a brief update regarding the 2017 program. Of the 12,800+ acres approved for hemp production in the applications, just over 3,000 of those acres were planted. Participants have reported a total crop failure at 26 different plots/fields, accounting for approximately 270 acres. Almost half of the crop failures were attributed to weed pressure and half reported lack of germination or emergence. Information provided by Kentucky Hempsters in collaboration with Kentucky Department of Agriculture.